...Inside the Romanian territory have been discovered the traces of various civilizations between 7,500 - 3,500 B.C. ...The "Pre-Cucuteni" culture is considered by the American specialist Marija Gimbutos for being the oldest European culture with the pre-Indo-European population at its development apogee between 5,000 - 4,000 B.C. ...The "Boian" culture (4,000 - 3,800 B.C.) 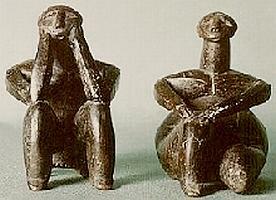 left us the first sanctuary created from clay and the "Hamangia" culture the first statue worked in marble in human history and the anthropomorphous clay statues "The Thinker and his woman." ...From "Vincea" culture, in 1961 Nicolae Vlasa discovered at Tartaria upon Mures (Transylvania) some small clay tablets dated 4,800 - 4,500 B.C., considered by the same Gimbutas as the very first written message in human history, much before the Sumerians tablets (probably arising also from the Danube). A real enlightening blog. Don't stop now. Here's a subject that interests many; how to buy & sell washington state bed breakfast on interest free credit; pay whenever you want. Nice visit to your blog! Come by and check out a great Internet Shoppingsite. Whether you are shopping for power tools or other items, you will find it here. The governments of 26 countries agree to release 2 million barrels a day from strategic fuel reserves to cope Hurricane Katrina's aftermath, the International Energy Agency says.